I speak to clients every day who want people to love their brand. But we live in a world where people are opting out of brand messages and advertising with ad blockers. That makes it hard to whip up an effective bit of brand love! In this new environment, marketers can’t assume their messages will reach people in the way they have in the past. Opt-in is in. Brands and mass media don’t control culture — these channels are increasingly controlled by people. Like it or not, marketers and community builders operate in an environment where people trust social institutions, organisations and advertising less every year. For the brave brand with an inspired mission, building a brand that your community champions for you can have a multiplier effect on impact. What’s the role of brand in community building? 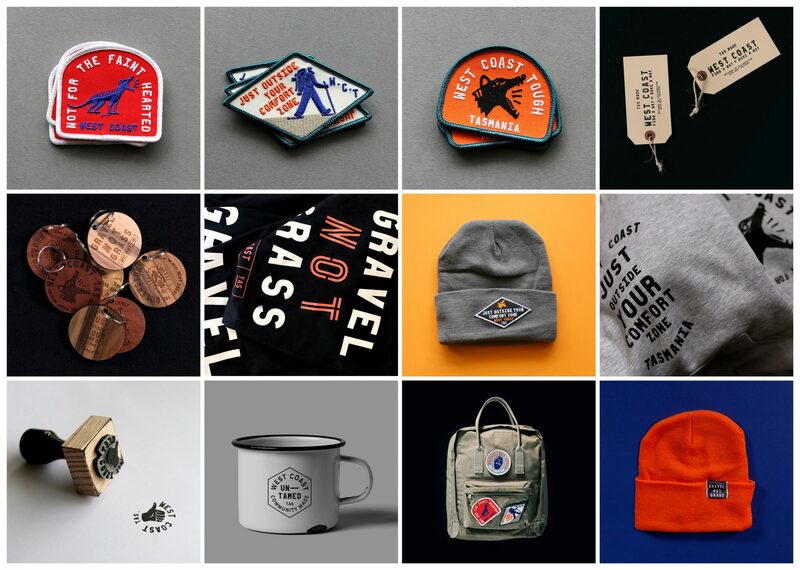 A community-centric brand actually takes inspiration from, and creates symbols of belonging that reflect the community that they exist to serve. This shift from a customer-centric approach to a community-centric approach actually puts your brand in people’s hands to spread the belief that binds them together. 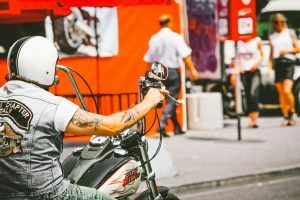 Bikers often wear their favorite brand with pride — on their skin. What is a symbol of belonging? Anything that identifies a community member as a member of a group. As humans, we already use these symbols to express ourselves. At its most extreme: think Harley Davidson biker tattoos. That’s some serious brand commitment! Why consider building a brand that reflects your community? Once we break branding out of its traditional box (i.e., brand as a tightly controlled entity), you can do far more, for less money, and with more impact than the traditional approach to branding, which doesn’t leave a lot of room to reflect the delicious dynamism of a community. So how do we harness that dynamism? Let’s take a look at brands who are doing it well. Rapha is a luxury cycling brand whose stated mission is to “make cycling the most popular sport in the world.” Their brand celebrates the “sufferfest” that is cycling. With a motto of “Ex Duris Gloria,” literally Latin for “glory through suffering”, the brand has built a global cycling community through a branded app where members can join and find rides with other cyclists. Along with regular rides, the company issues challenges every year, like the Festive 500: a call for cyclists around the world to cover 500 kilometers between Christmas Eve and New Year’s eve. Cyclists who complete the challenge and verify it through Strava are awarded branded roundels. What Rapha has created, in effect, is an army of advocates< advertising its gear for them — without the cost of traditional advertising. The West Coast Council is a regional council in far west Tasmania who needed to drive tourism and investment with limited marketing spend (full disclosure, this was one of my clients). In reality, the distance from the rest of the world and the tough attitude required to get there were what made it attractive to a very particular type of person, both local and visitor alike. In order to create a brand that would embrace locals and attract the right kind of visitor, the team spoke to the community in town-hall meetings and a Facebook group where local stories, favourite spots, and sayings were identified to tell a cohesive story about the West Coast. 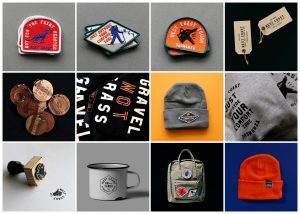 The brand identity system was designed to tell these stories and emblazoned on badges for hiking backpacks, enamel mugs, and hooded sweatshirts (it’s Australia, but it gets cold in Tassie!). One of my favourite pieces of work from the last few years is this rad coworking space for women (coincidentally, done by an all-lady design team by the legends over at Pentagram). The Wing isn’t just a coworking space with nifty branding. They’ve made being part of the community at The Wing something to be proud of: they embody a point of view about the world, and broadcast that through their communications (No Man’s Land, a podcast), how they speak, and what they provide to their members to signify their membership. My favourites: The Wing matches (along with The Wing’s manifesto), “light like a girl” lighter, and The Wing Rose Pin. How do you create badges of belonging? The trick of it is to understand in startling specificity exactly what your community believes, how they behave, and how they recognise other community members in the wild. Ask: What does your community believe? Getting clear on this shines a light on what to do next. For example, Lululemon makes reusable bags with a customer facing community manifesto printed on them. Rapha’s motto is “ex duris gloria.” Pro-tip — Ask: what do we want to transform by coming together as a community? Shirts for achieving milestones in running foster a sense of community. Look around: What behaviours already exist in your community? Where does this community gather? Where will these badges be seen? Rapha, for example, created beautifully designed stickers that cyclists can affix to their bikes. Parkrun, a collection of free, weekly 5K runs held globally by community organisers, award tee shirts to runners who unlock achievements by completing 10, 50, 100, or 250 runs. Ask: What, specifically, are the stories that emerge naturally that signify “belonging” in a community? Set up a focus group and probe for the ways that community members talk about their experiences. What do they love talking about? Patagonia, for example, found that consumers were re-selling their gear on eBay and other platforms — a testament to the durability of their product, and a direct link to their mission (We’re in business to save our home planet). In short: for the brand with a clearly defined mission, building branding systems that celebrate the belief your community stands for can act as a multiplier effect for your marketing efforts. A specialist in brand strategy, community building, and storytelling, Amanda Gordon is currently a strategy director at For The People. Over the past 10+ years, Amanda has worked to help some of Australia's most interesting people, planet and cultural institutions tell their stories more effectively, including the Australian Worker's Union, Perth Festival, State Library Victoria, Australian Ethical superannuation, the West Coast Council of Tasmania, and Streamtime. Her strength is in crafting, telling, and teaching the power of these stories in order to affect change in organizations and communities, and translating these stories into impactful creative and visual communication. Her work has been recognized by some of Australia, and the world's most prestigious ad bodies including D&AD and AGDA. She writes, speaks and teaches on the subject of branding, community and how creative businesses can change the world for the better.